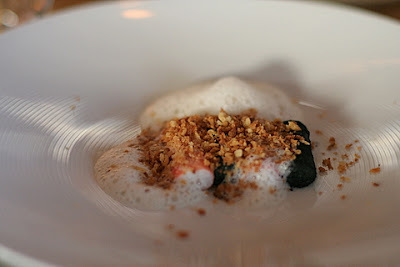 Together with Trine, we decided as for our meal at Pierre Gagnaire and as we shared this Noma dinner together to post our reviews simulteanously. You can read her review here ! May 21 of this year : Guillaume and I are flying to Copenhagen for a 24 hours trip and 3 meals scheduled thanks to Trine. We had a great lunch with her just after our arrival at Geranium. For Guillaume and I, scheduling 2 meals in a day is not too difficult to manage, we were used to move from meal to meal after our trip in Bordeaux earlier in the month. But for Trine… question was is she would enjoy this day like us ? 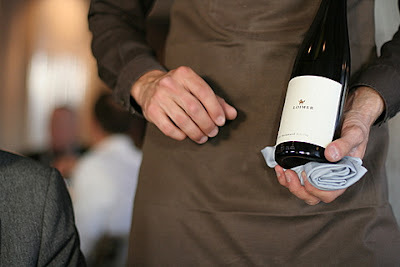 We left Geranium around 5 pm (if I remember well…) and 2 hours later, we were on the road to Noma. Trine was of course there again, joined by Klaus her husband. And dear readers, dear foodies, let me tell you that it was an incredible evening. An amazing dinner and an unforgettable evening. 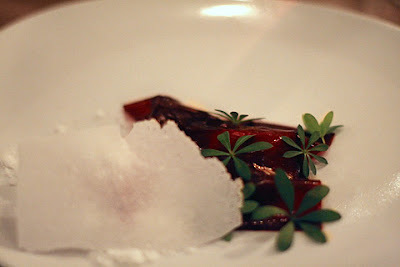 Many weeks later, i was still thrilled by this dinner at Noma. 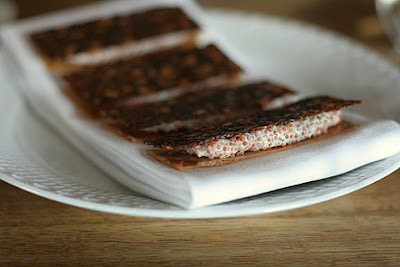 It was my second visit there (1st one for Guillaume), my first one being simply one of my best meal ever. So, after this great lunch at Geranium, we were ready, quite fresh enough (must reveal that Guillaume enjoyed a little nap in between), even hungry and excited more than ever to have this dinner at Noma. The location is so unique, as is the atmosphere and service, that i couldn’t wait to be there again. This time, the sun was still shining and lightening the dining room with sweet and amber rays. Our table is set in the middle of the room (as for my first visit) and i’m taking the same seat…which is commented by Lau saying « welcome back… oh, you were seating there the first time right ? »… like i said.. unique. And, cherry on the cake, at the table next to ours was sitting Heston Blummenthal himself (chef of the Fat Duck), the guy who gave me my best meal ever… until now. 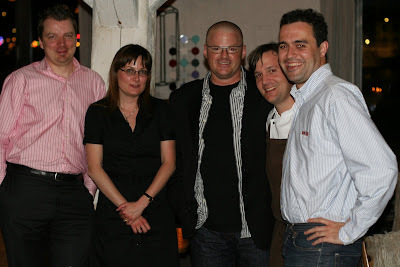 For us (Trine, Guillaume, myself), meeting Heston was really something unique. Some football fans are hoping to meet one day Zidane or Cristiano Ronaldo, movies fan have their secret hope to meet Angelina or Brad (i would go for the first mentioned :o), for us, it is about Heston Blummenthal, Pierre Gagnaire or Michel Bras. Guillaume is immediately impressed by the atmosphere : woods, candles, furs, it is typical and nordic, but elegant and relaxed, and really charming when you look to the small harbour in front of the restaurant where boats are covered by the last sunrays. A few seconds later Rene Redzepi (noma chef) is joining our table, welcoming us and announcing that he has set up a specific menu for us… which was of course fine and we decided to go for the wine pairing menu as well. At this very precise moment, when menus and wines are ordered, when you are installed and watching the people around, you are just enjoying the peaceful atmosphere, realizing how lucky you are to be able to live such ephemere moments. I’ll not go in too much details on each dish as i didn’t take notes during the meal and will not be able to be very accurate and detailed so many months later, so i’ll only focus on the dishes that highlighted the meal to me. The most orginal dish maybe : very soft tastes, fresh of course, very delicate, requiring some concentration to really appareciate the flavours. I loved it, but it took me some time to realize it. This dish is now a classic of course. You eat the whole dish with fingers, in a delicate way obviously. It was fantastic the first time I ate it, it was fantastic the second one as well. A wonderful preparation is offered here. The langoustines are of a superb quality, and were providing unforgettable tastes. A unique dish. This one was probably the most discussed one : the onion flavour is everywhere, and sometimes strong or let’s say very present, maybe too much at the beginning. But after some bites, you discover new flavours, some subtile touch of thyme. I loved it (i think i was the only one but not sure). This was for me, beside the classic dishes, the best dish of the menu. 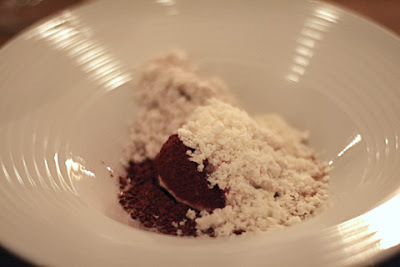 For 2 reasons : the dish itself is a wonderful piece of art : never had such truffle taste so concentrated, not strong, but so pure. The sweeteness of the salsifis and milk offers a fantastic combination. And the second reason is about the wine. For the second time in the same day, we have a champagne paired with a dish in the middle of menu. And again, as we experienced it at Geranium a few hours before (sounds weird to say that… i agree), we were totally convinced and enjoyed a lovely wine pairing with this Blanc de Blancs on one of the most fantastic dish of the year to me. 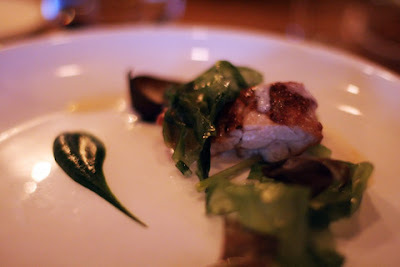 Was not really convinced by the cooking of the sweetbread, pure personal taste. Guillaume was totally under the charm of this sensual dish (from a picture perspective i mean, we stayed quiet at table). 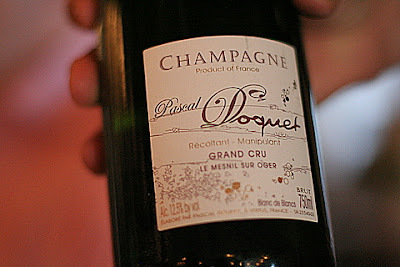 For the main meat course, i asked to change the italian wine planned in the wine menu by this Grange des Pères. Trine heard about this wine but had never tasted it before. 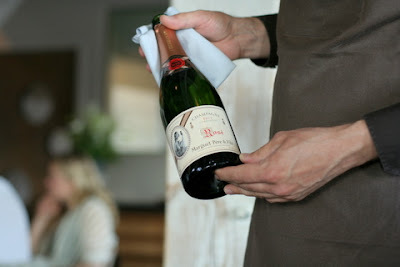 It was a nice opportunity, and instead of 4 glasses, we were offered the whole bottle. Great initiative we totally honored. While we are reaching the end of our menu, we have a look from our table to the kitchen where Heston and Rene are talking together. Some minutes later, in a quite sudden way, Rene is bringing Heston at our table introducing us. Wow, my friends, this was unexpected and surprising (i later realized that as Trine is a little bit at home here, Rene knew that it would please her to meet Heston… great initiative). 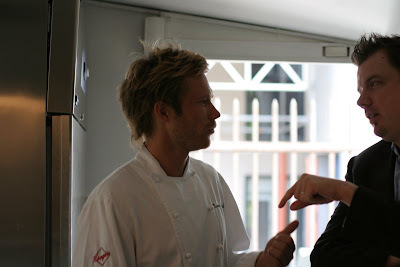 We are shaking hands and Trine immediately starts to talk with Heston, asking how he found his menu. And here we go for a 15 min chat with Heston and the four us. Unique. When Heston starts to greeting us for leaving, i’m asking for a picture together with René and us… and they both accepted very kindly. After this last course, we moved to the lounge room where a very nice and sweet appel liquor is offered to us. René is joining us with a glass too and we’ll spend 30min, 1hour maybe, talking together, discussing about Noma, food, gastronomy, France. I didn’t get this opportunity during my first visit to discuss like this with René. Thanks to Trine, this was feasible now and we really enjoyed it. We have discovered someone really accessible, friendly, simple, with great sense of humor, a little bit at the image of the whole Noma staff. Once in our hotel, we were too much excited by this evening for going in bed directly. We decided for a last glass at the bar (molecular cocktail …. ooops, have no clue of what we drinked there). A small hour later and we were in our beds, no time to step in than Guillaume is already sleeping… no comment. I can’t be that fast and need some time to recover from my dinner… a wonderful dinner, closing an unforgettable day. For sure one of the best of foodie day of my life. Thanks again Trine. Thank you also René for your time and talent. Simply unique. After our wonderful trip to Bordeaux two weeks before, we were again on the road with Guillaume by this sunny wednesday for another food trip : to Denmark this time, a 24h trip for 3 meals. 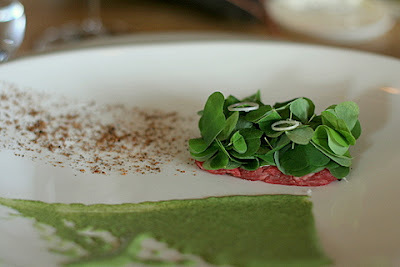 Thanks to Trine, we had a great opportunity to book a table at noma for dinner, and we took advantage of this to book 2 lunches : one at Geranium, the second at The Paul on thursday. The timing today is tight : leaving Paris at 11:00 am, landing in Copenhagen at 13:00, we had 1h to reach our restaurant located in the city centre. But everything went perfecly well : we arrived at Geranium around 13:45 and were relieved to enter the place on time. We’ll be 3 for this lunch as Trine will join us a couple of minutes later, a pleasure to meet her again after our first meal at Pierre Gagnaire. In order to enjoy and discover the food served here by a duo of chefs (getting their first Michelin star this year), we’ll go for a 4 courses menu. This is a very delicate and fresh appetizer including small shrimps and green strawberries, matching perfectly well with a glass of champagne. This gives already the tempo of what will be a terrific lunch. Wow, it’s just the second dish we get since we arrived in Denmark and it will be probably be one of the dish of the year to me. Before the plate being served, the chef himself is bringing small pots with ashes inside, then open them and this enables the smoke to parfume the table. Then arrive the dish itself. 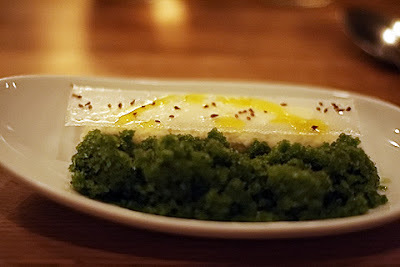 Great tastes, the textures are just amazing : raddish, fish eggs, .. you can’t almost describe what’s in your plate. Surprising and very tasty dish, working well with the smoke parfume and completely disturbing you but in a positive way. Quite original and probably the first time that we received a glass of champagne in the middle of a wine menu (after dry wines i mean). When smelling it, i immediately announce it smells « asparagus »… i saw Guillaume and Trine a little bit confused… ok, i realized it was a little bit strange. But then arrive the dish with the asparagus inside… hmm, then we must admit that the wine smell was indeed about asparagus. 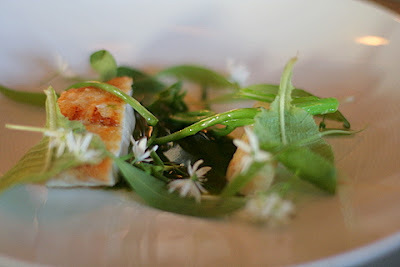 The turbot was perfectly cooked : fresh and tasty, it was a great pairing with both the asparagus and the champagne. This is again something fantastic. It’s not just about cooking, it’s also about art here. Visually, this is simply wonderful. And from a taste perspective, it’s just awesome. This main course is another wonderful picture. And the products are matching here again, even it’s less surprising then the previous dishes we had, but the tastes are again excellent, a smooth dish, with sweet and soft tastes, very pleasant. The red italian wine was superb, kinda wine we like : rich, long, well balanced and with a fantastic nose. What a great dessert ! Very creative again. But well done and hitting the target in the heart. Milk in different textures even in crispy leafs served by the waiter on top on a paco-jetted ice… Getting a great wine pairing was not obvious. 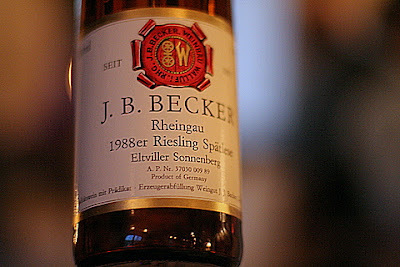 But this Mosel wine was so good, one of the best i could drink with a dessert. After such a great meal, it was important for us to congratulate the chefs for the quality and creativity of the menu. We used to opportunity to introduce Guillaume’s friend Paco Jet to Trine and moved to the kitchen where we met Rasmus, one of the owner chef. We have a nice chat with him while Trine again is shooting all what she can (it remember me something… :o). For the coffee/tea, we are moving to the terrasse in the park. The air is getting fresh but we enjoy the place and keep relaxing near the trees. In 3 hours now, we’ll have our dinner at noma. But too early for preparing it now, we want to enjoy our lunch. Geranium is certainly the raising star of Copenhagen. 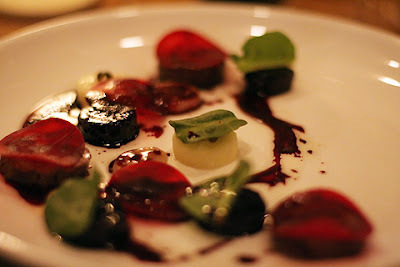 A real must, as Noma, for any food addict wanting to discover danish gastronomy and progressive cuisine. The service is young but efficient and knowledgeable. The beautiful dining room is small but this gives easily all intimacy needed. The wine list is (as for most of top danish restaurant) just fantastic : for instance i saw they had Cedric Bouchard Blanc de Noir Roses de Jeanne champagne on their wine list… this is a good indicator. And last but not least, the food is just fantastic, meeting our customer expectations when talking about contemporary cuisine while keeping a real and own identity. Thanks to the Geranium team for this great lunch (and thanks again Trine for organizing it and sharing the kitchen pic :o). Après moult hésitations, le choix du 2ème restaurant visité lors de ce (fabuleux) week-end à Copenhague – le premier étant Noma, voir post précédent – se porta finalement sur le restaurant Paustian, « rising » star 2007 du Michelin. Le choix était pourtant assez vaste avec des adresses confirmées comme MR, Formel B ou les récents Geranium ou Nouveau – la ville semble compter plusieurs adresses d’excellente réputation et parmi elles pas moins de 8 restaurants étoilés. Mais après avoir lu que Paustian et son chef Bo Bech revendiquait – entre autres – l’adjectif moléculaire pour décrire sa cuisine, je ne pus m’empêcher de tenter l’expérience. Le restaurant se situe à une distance plus éloignée du centre, bien caché dans les méandres portuaires au Nord de la ville. La salle est très agréable et assez originale, ambiance discrète et tamisée, grandes tables rondes, très espacées, très grande hauteur sous plafond, le blanc est dominant (murs, nappes) à l’exception de 2 pans de murs dont la moitié haute est peinte dans un concept plutôt décalé par rapport à l’endroit. Confortablement installés, et prêts à repartir pour un nouveau voyage culinaire, nous optons pour le menu « Alchimiste » et son menu Vins associé. Chose intéressante à souligner : la cuisine est scindée en 2, la partie cuisson où officie le chef étant totalement ouverte sur la salle. Intéressant mais pas non plus révolutionnaire car de nos jours de plus en plus de restaurants veulent jouer la transparence et l’ouverture sur leur cuisine. Avec les amuse-bouches, on entre de plein pied dans le vif du sujet. Du croquant, du moelleux, du piquant, du doux, des goûts vifs, précis : une première rafale de micro amuse-bouches qui donne le ton : difficile de savoir ce que l’on va manger à la simple vue de ce qui nous sera servi… l’explication de texte s’impose. Pour accompagner ces amuse-bouches, nous choisissons l’apéritif maison : infusion de thé et mousseux blanc italien (dont j’oublierai malheureusement le nom) : belle fraîcheur, acidité, léger dosage en sucre. On apporte ensuite ce qui s’avérera comme la grosse sensation de ce repas : le pain. Le meilleur plat du menu. Sur le poisson repose une large rondelle de céleri (froide et légèrement cuite) sur laquelle repose des «écailles » en lamelles de poire (moelleuses et tièdes). Un plat esthétiquement joli, mais trop fade en goût… nécessitait d’avantage d’assaisonnement pour en exprimer réellement les saveurs. Plat assez neutre, c’est bon mais ne propose rien d’extraordinaire du tout. On passe. Toujours spectaculaire de se faire servir une dégustation à l’azote liquide. On est bien d’accord, cela n’a gastronomiquement que peu d’intérêt, on entre ici dans le côté ludique de la gastronomie mais cela peut parfois faire des merveilles quand un plat sert à éveiller votre palais et vous apporter de nouvelles sensations gustatives (ex. The Fat Duck ou L’Air du Temps où ces dégustations ludiques ont vraiment leur sens et leur place dans le menu). Le produit est d’une qualité exceptionnelle assurément. On va dire qu’ils n’ont aucun mérite etc etc.. ce n’est que du maquereau certes , mais un poisson bleu de telle fraîcheur, cuit avec précision, qui s’offre à vous dans son plus simple appareil, ça vaut les produits les plus nobles du monde. Sur ce pigeon, on est sur des goûts et associations plus classiques, cuisson parfaite comme je les aime : saignant mais pas sanguinolant. Très bon. Le vin du Piémont soutient très bien l’ensemble du plat, bel accord. Le meilleur dessert ! N’étant pourtant pas fan de banane (du tout même…), je me suis fait violence et que ce fut judicieux ! : cette glace était tout simplement extraordinaire, l’huile d’olive apportant ce côté vert, fruité associé au goût assez doux de la banane, le tout dans une structure glacée se mariant avec bonheur avec les grumeaux de chocolat et le caramel coulant… une belle gourmandise ! Quelques mignardises ensuite, dont une délicieuse barbe à papa aromatisée à l’orange, annoncant la fin de repas, nous ont été servies. Parlant du service : jeune, efficace mais assez distant au final, pas de défaut particulier mais rien d’inoubliable non plus à noter. Revenons quelques instants sur les vins servis. Ils furent tous d’un bon niveau, notamment sur les rouges. Maintenant, côté rapport qualité prix, on est clairement limite, 100 euros le menu vin pour ce qui a été bu et servi, c’est exagéré… et quand on croise le même Pouilly fumé du même producteur et du même millésime le lendemain au free tax shop de l’aéroport à 5 euros la bouteille… on se dit certes que c’est une bonne affaire à se procurer pour sa cave perso mais que là le rapport avec le tarif pratiqué au restaurant est trop grand. C’est évidemment le risque pris dans ce genre de menu. On peut s’en sortir avec satisfaction comme se faire littéralement voler. Mais passons sur ce point, Paustian s’est avéré une très belle adresse… totalement différente de Noma qui est bien entendu unique en son genre. Mais il n’était pas facile de succéder à la cuisine de Rene Rezepi : la cuisine moderne et high tech de Bo Bech a relevé le challenge plus que correctement. Une cuisine suscitant les sens, explosive, volontairement provocatrice. Heureusement, elle ne se la joue pas uniquement ludique et cherche aussi à délivrer de vrais plats (racines, pigeon, maquereau), mettant clairement en avant le produit. Les amateurs de moléculaire y trouveront donc leur bonheur même si je m’attendais à une cuisine plus sophistiquée, plus surprenante, plus engagée dans le moléculaire. Ce menu offre un bon compromis, la carte doit probablement réserver d’avantage de surprises et d’émotions. J’y retournerai je pense volontiers pour une nouvelle dégustation … mais après avoir découvert les autres adresses gastronomiques que cache la ville de la petite sirène … (qui est vraiment petite). 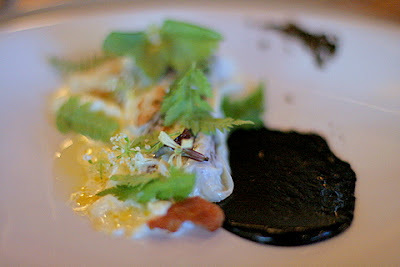 Noma is just the name of a fantastic restaurant in Copenhagen where I had a dinner last Friday. 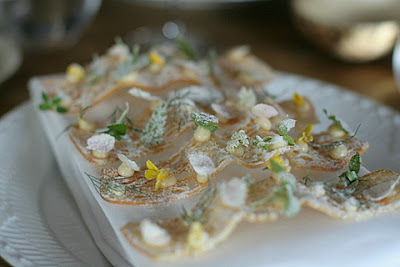 For the first time, I’ll write a review in English, not that I’ve suddenly decided to add complexity in my review exercise (it’s already difficult enough to express things in French), but simply in homage to the great Noma team led by its chef Rene Redzepi.Restaurant Noma (No for Nordic, Ma for Mad = “food” in Danish) has been ranked this year 15th best restaurant of the world. Not a guarantee of great experience but looking to the restaurant philosophy described on their website and thanks to the contribution of several blogs (let me mention again Trine for the remarkable work she’s doing on her blog) I was highly confident that I would enjoy a great moment there… the question being : will it be a breathtaking experience that you can only live a couple of times in a life or will it be just another very good dinner in a 2 Michelin stars restaurant ? I was therefore really excited, but without too high expectations (lessons learnt…), when I entered the restaurant around 8 pm after a short taxi drive from the city centre. The restaurant is located in a warehouse, in front of the water, with a view on the city and more particularly on Nyhavn, small harbour nested near the city centre. When you enter the place, you feel immediately like being transported out of time : candle lights, darkness, natural wood almost everywhere, animal furs on seats and in front of you, the kitchen, modern, semi-opened on the restaurant, you see the chef and his team preparing the dishes. We were suggested to have an aperitif in the small lounge next to the bar. After a first glass of champagne (Blanc de Blanc, Agrapart) and first appetizers (natural crispy chips revealing unexpected but very good tastes), the chef itself came to us bringing the second appetizer : a smoked quail egg : intense, great texture, tasty. While doing this, he announced us he had prepared a specific “surprise” menu for us … we were of course pleased – I guess we can even say “excited” – by this nice announcement. After this second appetizer, we moved to our round table, placed in the centre of the dining room, with a nice view on the kitchen and we felt ready to start this tasting menu ! It was not only visually beautiful, it was perfect in mouth as well. 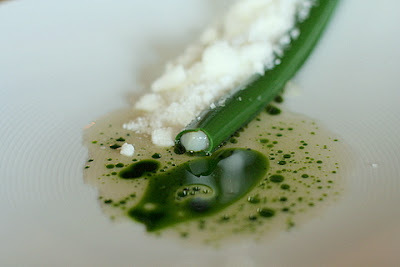 Fresh opening dish for this menu, the oyster jelly is perfectly balanced (not too strong but present enough). We liked it. High quality products, it works well. 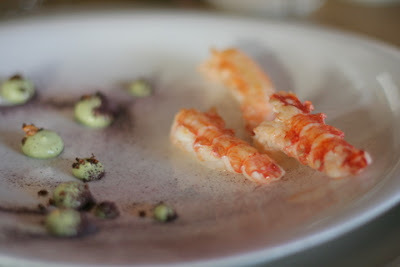 The texture of the gooseberries is interesting (lightly frozen) and brings a nice contrast with the shrimps. At the end, this dish will appear to be the most “common” one to me, the one that surprised me the less. Wow. I thought I had eaten king crab before…. I need to talk to my fisherman again. Probably one of my favourite course of the dinner. 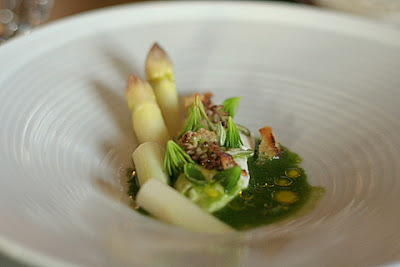 The leeks are ashed and are fitting perfectly well with the king crab. 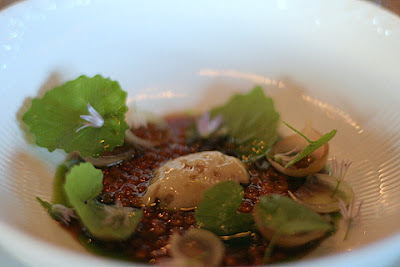 The mussel emulsion brings sweetness and a light creamy taste. It looks so easy when you see it in you plate, but the quality of each product, the perfectly cooking of each element are making of this dish something close to perfection. Well, at this stage we had no words to express our feelings as the sequence of dishes we received was so amazing. And we have to agree that this lobster dish is reaching the same quality level than the previous courses. Flavours exploding in your palate, the quantity of each ingredient is perfectly measured, this is a very well balanced course, again should I say. I’m not fan of sweetbreads but I must admit these were very good. The dust of thyme is interesting as it brings another texture feeling in the palate. Not too strong and enhancing the whole dish savours. I thought I was arrived to the end of my surprises, not really. The meat cooking is here perfect and of course tasty as you unfortunately can’t find easily at your own butchery. But the biggest surprise of this dish was the wine pairing…: a Saumur Champigny … so strong, so rich, perfectly fitting the meat and chanterelles… I thought the wine would have been too light after the Charlopin on the previous dish, but no, absolutely not… what a pairing ! Nice first dessert, fruity, light, fresh, exactly what we could expect as first dessert after such tasting session. And again, what a wine : this Italian sweet red wine was absolutely fabulous. 5 hours later, we reached the end of this dinner and I must say it has been for me a wonderful experience. 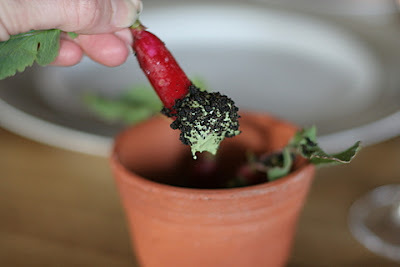 I’ll not come back on the food : best products, perfect cooking method, wonderful visual in each plate, clever pairing. 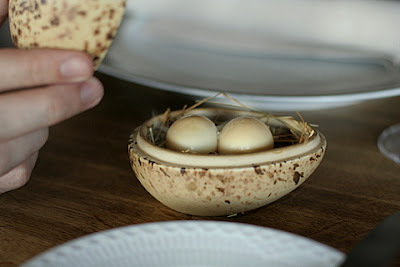 There is a little of Michel Bras at Noma : focused on local products with a unique goal to bring them to the light, in a creative and personal way. – Service : Top service (don’t expect a 5*Palace service, expect a professional but human one). What a generosity, so talented ! 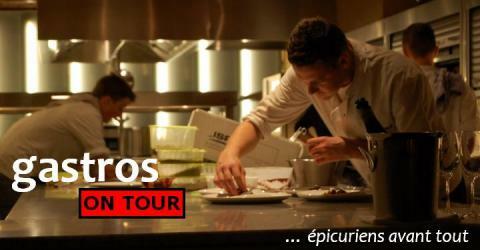 They are transmitting to you the pleasure they have to serve you, to be the link between the chef and yourself. And when it’s not someone from the service team that serves you a dish, it is the chef itself or one of its cooks… They were so excited to bring the dish at our table and explained us each ingredient… I loved it. I love Noma because it’s a “human” restaurant, contacts between people are natural, direct, simple here… it’s a small heaven out of time, where I’ve felt serenity and happiness. I love Noma because you feel the kitchen breathing. Quietly seated at your table, you feel they are giving the very best of themselves. I perceived it as they were risking their life on each dish coming out of the kitchen. I felt touched by such involvement… really. I love Noma because the restaurant and the chef are fully assuming what they do. They don’t try to copy with the risk to give pale imitations. They’ve chosen to build their restaurant on Nordic food and they are precisely famous for that. I love Noma for the exceptional dishes delivered. It’s pure. It’s one of the most personal and honest cuisine I’ve met. I guess I have the answer now.